There isn't one for Vale View School. 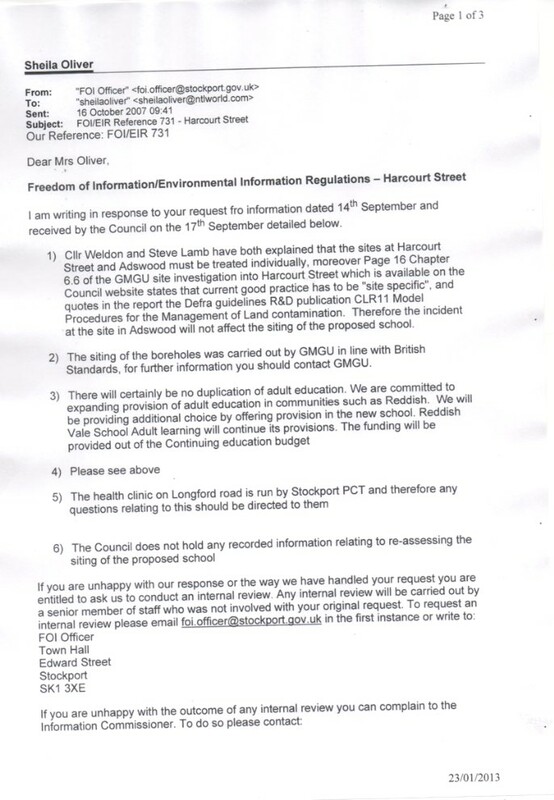 There is no asset management plan for the toxic waste dump school. Why not? "I am DEEPLY concerned that the SBC have commissioned a new multi-million pound PFI school WITHOUT any Asset Management Plans. Please correct me if I am wrong but Capital Funded projects SHOULD have a AMP and the SBC Policies and Proceedures require an AMP. In the absence of any recognised AMP how can the SBC guarantee any transparency or accountability for public funds? In the absence of any AMP, is the school not operating in a legal Void?? I understand that an AMP is a legal requirement." "The ABHSF is a useless piece of information if the PA is not included because no reconcilation can be undertaken. Could that be the reason for the LARGE overspend. 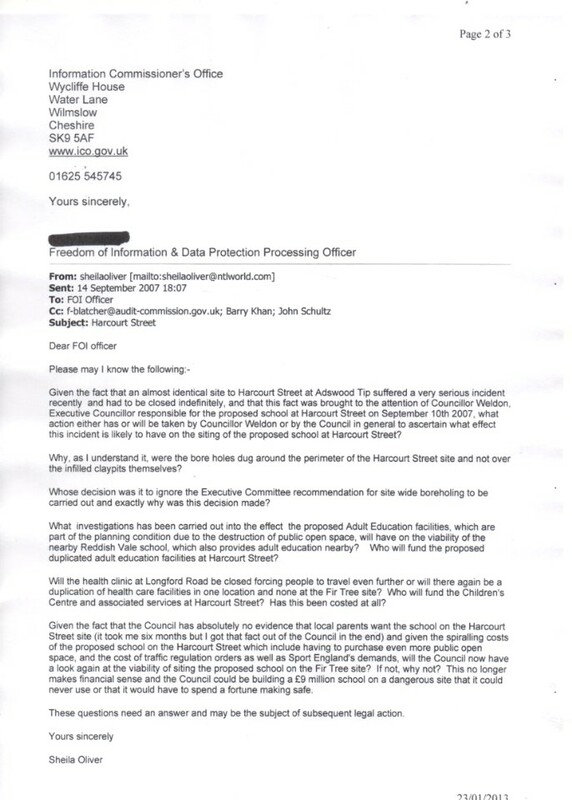 The Headmistress at the Vale View school is unable to audit or reconcile the project. Can you please explain that.Can you also please explain to me why the PA is not avaialable via electronic transfer or CD." "SBC have confirmed that there are no Design Change Order Logs relating to the ValeView school.This is most UNUSUAL on a multi million pound contract. So,it would appear the Contractor (BAM) can make any changes on a whim". 1) An ambulance crew was unable to reach a lady in her 80s who had collapsed at home - due to presumed planning irregularities in the 1980s, these houses have been built back to front and there is very limited access. 2) If these householders have large items of furniture delivered, for example, these items will need to be carried possible a quarter of a mile to their homes. Either they were told from day 1 this was a risky venture, so why did they pass the proposal with no reservations.? Or, after making public statements that the proposal was kosher they then found out it wasn't so kosher. So why didn't they change their public statements? Furthermore if this information on high risk was publicly available ( although difficult to get to) then what other motive is there for the continual denial by Cllrs of that which is openly known? 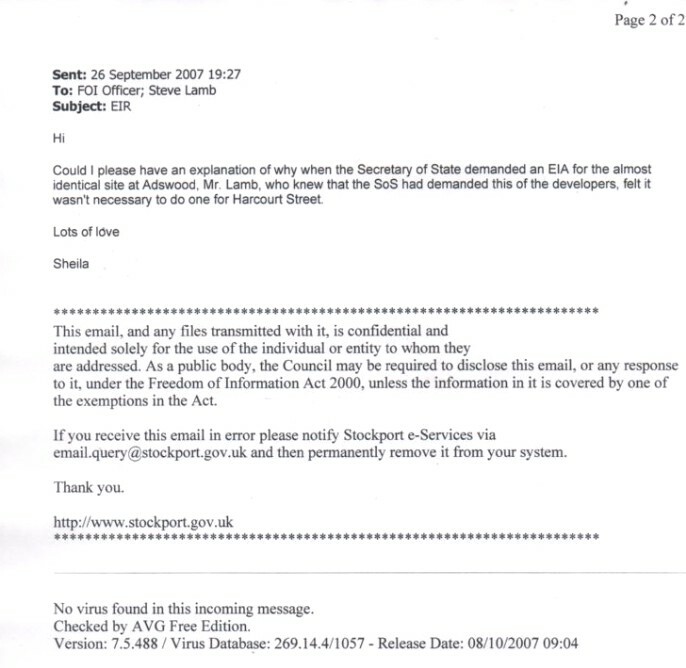 Andy MacKenzie - I have asked to see his files and was ignored. I got sidetracked and didn't pursue it. I asked again to see his files about 6 months later and was ignored. I asked again and was told Andy McKenzie has no files on Harcourt Street. 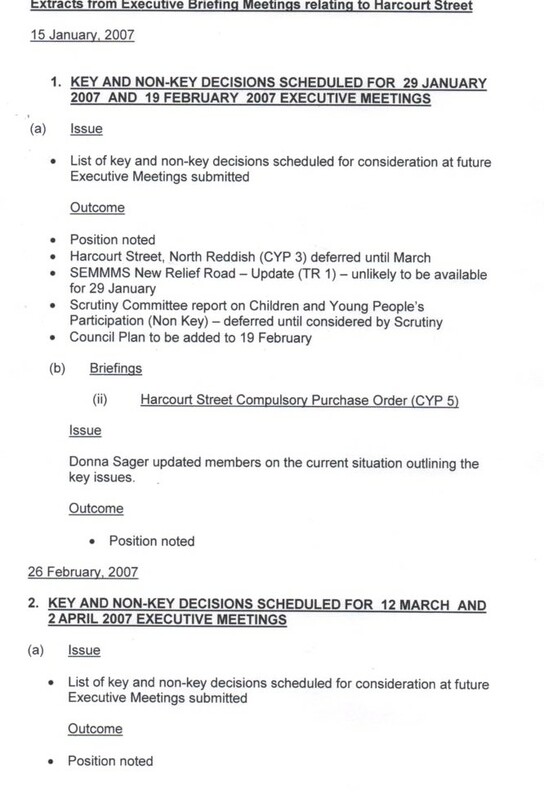 When going through this last FoI stuff it turns out Andy MacKenzie works for NPS Stockport and is the Chief Architect bloke. CW is Chris Woolard and it was him who had the email in the NPS files in the Harcourt Street file about the Fairway School. 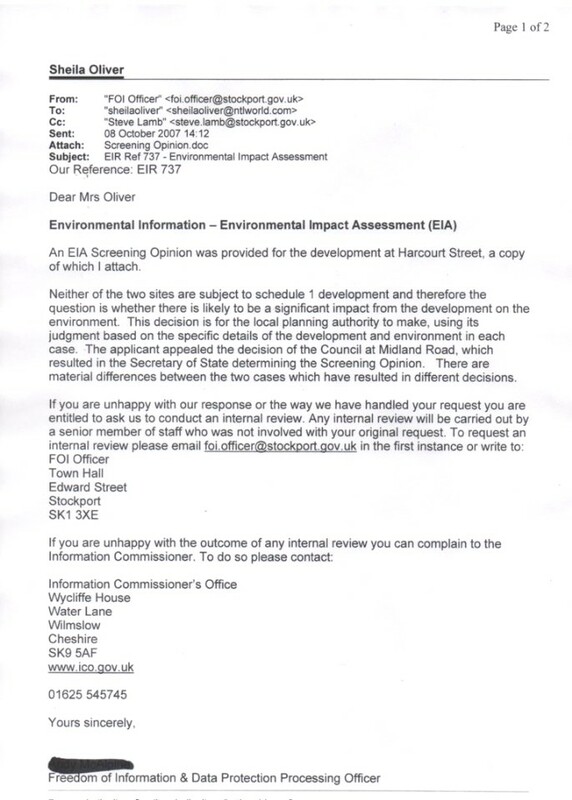 What has the Fairway School to do with the toxic waste dump school? Because 2 risks are numbered 11A and 21A there are actually 38 listed risks, which means instead of 25% it's 23.9% BUT 5 of the risks are now closed or resolved, so there are 9 High or Medium High Risks out of 33 concurrent risks 27%. In general about a quarter of the risks are High or Medium. Looking through the lists there are some obvious ones missing. For instance Vandalism on the site or Health and Safety issues on the site. Or would the Council say well we've handed the site over to the contractor and it's their problem? But the one that isn't there is a specific Risk of more contamination being found; or presently known contamination causing extra disposal of soil etc. Risk 23 is a bit on the line but I think that is more to do with load bearing characteristics of the land. Also Risk 34 talks about parents losing confidence but is not evaluated or ranked. Why not? The CPM name right at the top has changed from AJM in May to BB in June. I was looking for a Version Number to give an idea of how many times the Register has been amended. There isn't one I can see. In the words of Sherlock Holmes. Why didn't the dog bark? If contamination is a consideration; if some evidence of contamination has been found; if the risk has even been 'closed" or resolved; if virtually every conceivable risk has been listed, then why oh why is there not even a mention nor a sniff of Contamination in this wonderfully crafted Register constantly being modified over time and experience? Do they just not care whether there is or isn't contamination? "And he's copied this to god knows who. Has no one raised any concern about the wording? Does everyone this is totally acceptable ESPECIALLY given the circumstance ( and this is a very important circumstance) that there is considerable public disquiet about the whole process " highly likely Sheila Oliver will be objecting"
How can/dare anyone suggest hiding or less than emphasising any aspect of a controversial proposal? Where is the talk about contamination; traffic concerns, Child safety"
A valid point. If a child has had a serious accident within days of the school opening, does the playground meet the required safety standards? (Nothing else does). My account with the What Do They Know website was suspended because with his full permission I posted up details of the Town Hall Protester. I did this in a desperate attempt to prevent them repeatedly sending this completely innocent man to prison. They were driving him to suicide as they played their part in doing with other Stockport people - Andrea Adams who jumped from a tower block aged 18 and Alison Davies who jumped from the Humber Bridge with her young autistic 9 year old son Ryan. I make no apologies for trying to save a life and trying to stop appalling human rights abuses by this council. Please see the Town Hall Protester page of this website. This page is still under construction. They rushed to finish this school in a ridiculously short time (circa 6 months). You will cut corners if you have to rush, I said, and corners can't be cut regarding the contamination. Don't be "vexatious", they replied. And, they still do. 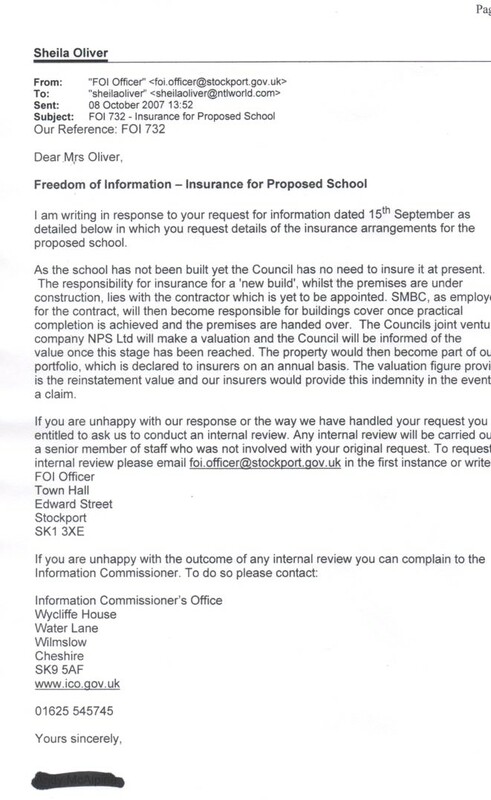 "I am V surprised the Vale View school managed to obtain a Public Liability Insurance Certificate because they do NOT hold any Building Completion Certificate or Fire Certificates or any Air Permeability Test results. They do not hold any Soil Resistivity Test results either which are normally obtained PRE CONSTRUCTION. I must say the headteacher at this school is a WONDER WOMAN having to deal with the design,construction and operations of this school,plus all the Risk Assesments etc and the FOI challenges. I really admire her because how she fits in ALL this responsibility AND teaching duties AS WELL." More worries about how this entire project has been handled. It is not possible to have confidence in any of the "experts" involved because the initially said the site was completely safe and that children could be protected from toxic hotspots by means of prickly bushes!! They should have been immediately removed from any further work on this school but, of course, they weren't. Local people were cheated as well by what has been done regarding this footpath. This means if they have furniture delivered it has to be carried maybe a quarter of a mile and an ambulance crew was unable to reach a lady in her late eighties who had collapsed. After creating the mother of all dangerous traffic problems for the primary school children, they try to take away the lollipop crossing lady. LibDems - heartless! More failure to comply with standard practice. Why have we paid such a lot for this school including exorbitant property charges to NPS Stockport if it is such a dog's dinner? More danger to local residents. The Fire Service won't be able to have access. Still, what does Stockport Council care about anything? SMBC fails to hold records in a correct manner as stipulated by the Information Commission and then claims it would take almost three weeks of an officer working full time to assemble and remove all the secrets from the files on one primary school. If Stockport held proper records, such ludicrous and frankly unbelievable situations would not arise. Me branded "vexatious" again for trying to stick up for the rights of local residents exactly what the local councillors should be doing. More financial shenanigans. They sent me the contract - they were forced to - but with important financial sections missing. If they applied the correct financial management progamme, why was the entire project such a dog's dinner with regards to the costs? This Supreme Court ruling means that local councils are automatically liable for any case of asbestosis or mesothelioma contracted in schools. So, with hundreds of children on that site every year, not to mention the teachers and ancilliary staff, they entire Borough is likely to be bankrupted in the future by these secretive LibDems and senior council officers. The costs of asbestos claims have bankrupted huge American corporations in the past. I have to question, not for the first time, whether any of those involved with this project are suitable people to hold public office? I need to keep an eye on when this large amount of land is sold, who the selling agent are, how much it is sold for. I don't know why the toxic waste dump school couldn't have gone on this safe site, with no toxic waste, no traffic problems, no need for extra charges for installing electricity, water, gas telephone etc, no drainage problems, no compulsory purchase problems, where many parents wanted it to go. 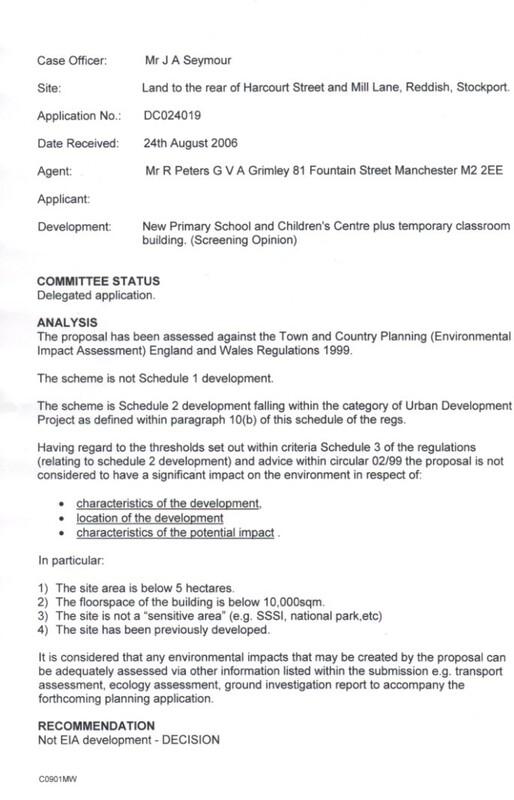 It will be interesting to see whether GVA Grimley is involved with the sale - the chaps who wanted political pressure put on the planning committee to get the school on the toxic waste dump, thus freeing up lots of land for development. The Harcourt Street planning application goes to Tame Valley Area Committee next Monday for a decision. The Council has forgotten to advertise it as a departure from the UDP. According to my legal advice (and to common sense if this town actually believed in honest and not fixed consultations) this must be done and people's subsequent objections taken into account before any decision whatsoever is made. So, the issue cannot be put before Tame Valley on Monday. I hope you will take note of this. We can't have the Council working outside the law yet again. Having objected and objected all along regarding the traffic chaos this will cause and been told everything is "robust" (God I hate that word), now a couple of days before they have turned everything on its head, propose to take even more land and haven't given us time to properly look into the consequences not to mention the cost of this latest development. Councillor Goddard, you have a lot of work to do if you want to change this from a dirty council. Secondly, at least you weren't bribed into accepting congestion charging with a SEMMMS carrot. I do actually believe that consultation was genuine because they phoned up my husband. I am less tired now and have found the information I need so I repeat my request of god know when. THIS IS NOT A NEW REQUEST. 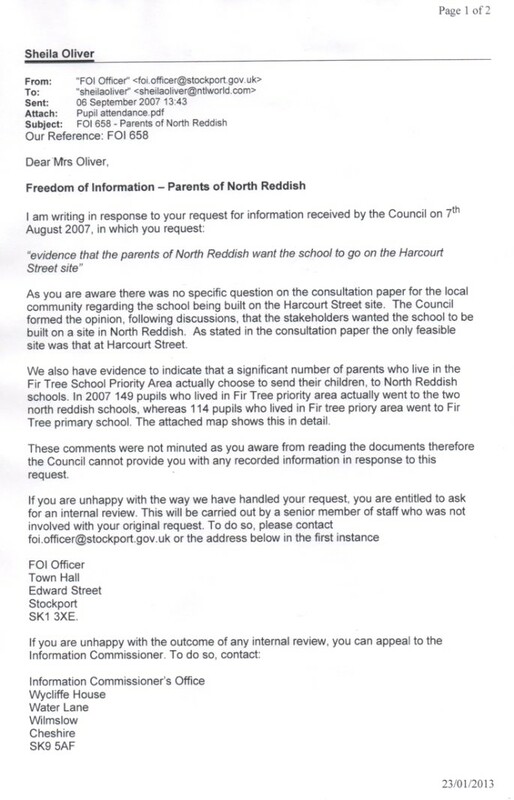 Please may I see the minutes of the schools organisation commitee meeting of July 2005 and the paper presented ther entitled: "Amalgamation Consultation Fir Tree Nursery, Fir Tree Primary, North Reddish Infants and North Reddish Juniors." I need to see the consultation reponses from the parents saying they want it to go on the Harcourt Street site. If you need to for Data Protection issues, black out the names and addresses. This last point is a new request. Will the Council's insurers cover this toxic timebomb school? I am "vexatious" for even asking that question. "Furious governors are demanding to know why their £8m super-school is still unfinished a term after opening. The governing body of Vale View primary school in Reddish has written to the Council with a catalogue of 'serious concerns'. Governors at the state-of-the art 550 pupil school - which opened in September - have called the situation 'unacceptable'.Last month the school was evacuated after a ceiling to an office collapsed. Governors now say fixtures and fittings keep falling off and IT equipment has not been correctly installed.They complain workmen are still on site nearly six months after opening and slam 'a multitude of outstanding items not completed'. Their letter says: "When can we expect an end to this situation? We have been patient, tolerant, understanding and accommodating so far, and appreciate all the hard work so many people have put into getting our school up and running, but the situation is now becoming not only untenable, but simply unacceptable." multimedia whiteboards and IT equipment is slammed as 'inadequate and insufficient'. The letter adds: "Weekly neetings between staff here and the contractors to update on what is happening are now becoming entirely non-productive." building. "However, it is common for some works to continue during a 12-month period following completion of any building work. As part of their contract the builders are workingwith the school to ensure this work is undertaken at times which are most convenient to the school." 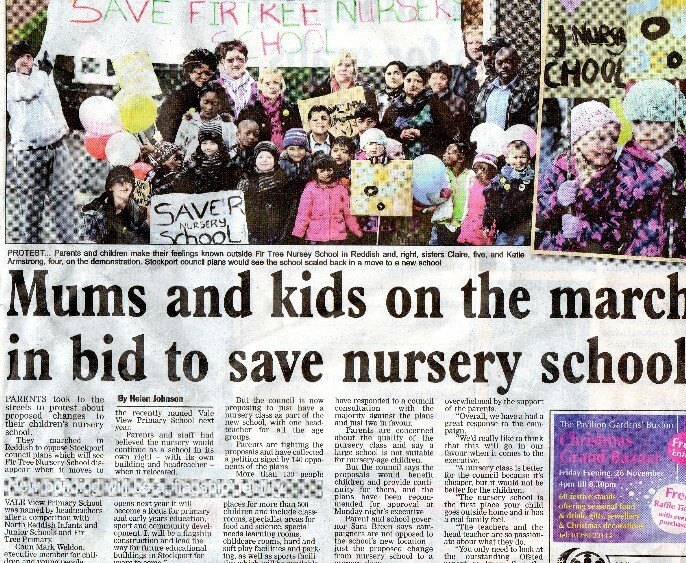 The Council promised these parents their much-loved nursery school would transfer to the toxic waste dump site. They reneged on that agreement and gave them a nursery class instead. 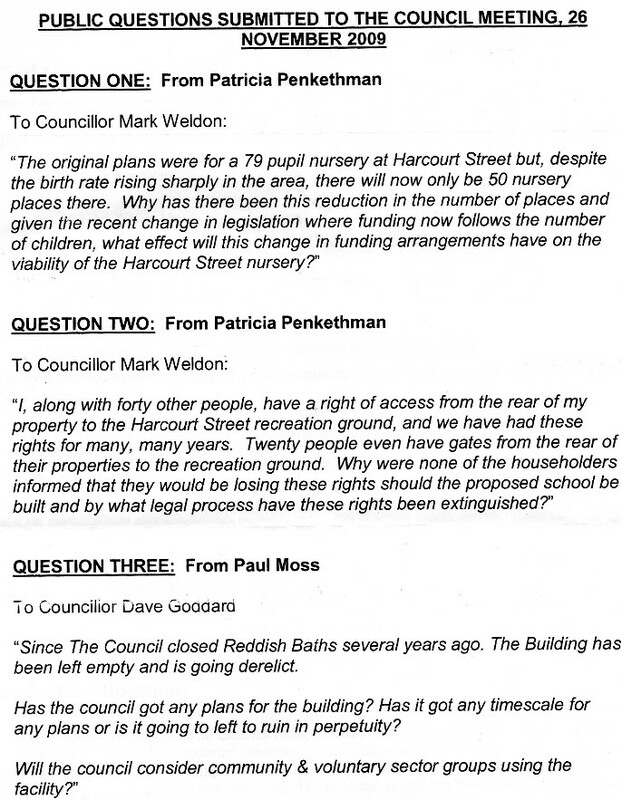 There were two consultation exercises, both of which firmly in favour of keeping the nursery school. 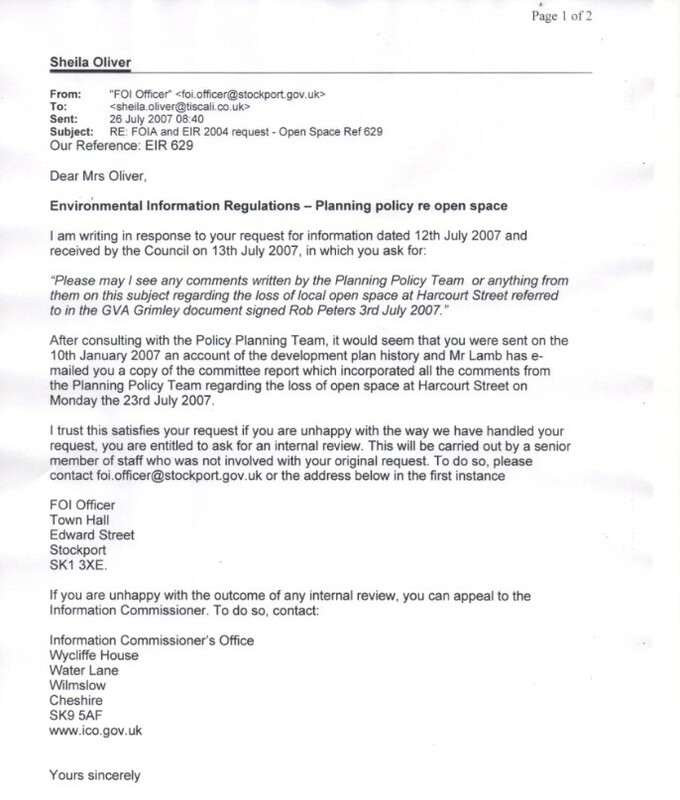 As usual with planning in Stockport, the needs and wishes of local people were completely ignored. There should be a sustainable drainage system at the school - they set aside £75,000 for it. Is it there? We can't find evidence of it and they won't respond to my questions. Please see aside for details of sustainable drainage. 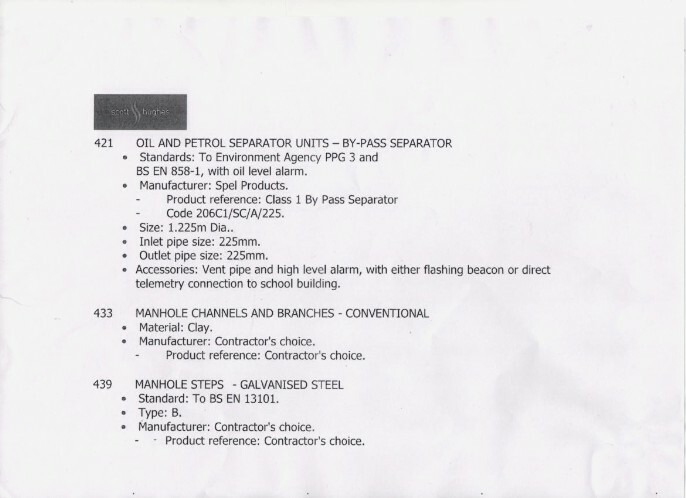 Above are details of the oil and petrol separator - the sustainable drainage system insisted upon by the Environment Agency. But, has the school actually got one? I shall keep the site posted on that one. At least Torbay Council takes the issue of lightening protection for school seriously. 3185m2 and this is to cost an extra £1,050,000. Item 6b 3.2 the cost per metre 2 is put at £1450. 3185 - 2600 = 585m2 @ £1450 = £848,250 and not £1,050,000. Please let me know what action was taken." "Vexatious", I thought there was a Council policy for reporting Fraud and Financial Irregularities. Apparently not! There was no noise survey submitted with the planning application. Obviously it would be impossible to survey something that is not there at present, however, issues of noise disturbance have been addressed in the committee report within the section relating to impact on residential amenity in the analysis towards the end of the report. You have a copy of this as Mr Steve Lamb e-mailed you an electronic version. Please refer to this for information in respect of the noise related issues that have been considered. You will note that that within this report it is acknowledged that there will be a change to the area in respect of noise as a result of a school being located at Harcourt Street. However it is also acknowledged that this would not be significantly different than any other existing school site within the borough. Measures relating to landscaping and hours of operation are also discussed to help mitigate in respect of noise impacts. The quantitative loss of public open space is in conflict with the relevant UDP policy. This is clearly explained in the committee report on the application and accordingly, the proposals have been advertised as a departure. However this matter is addressed by a qualitative improvement in other open space. Whether this is an acceptable balance is a matter for the Planning & Highways Regulation Committee to determine tonight, along with all the other planning issues raised by the application. I attach the planning consultant’s response to the traffic concerns which has been received to day. 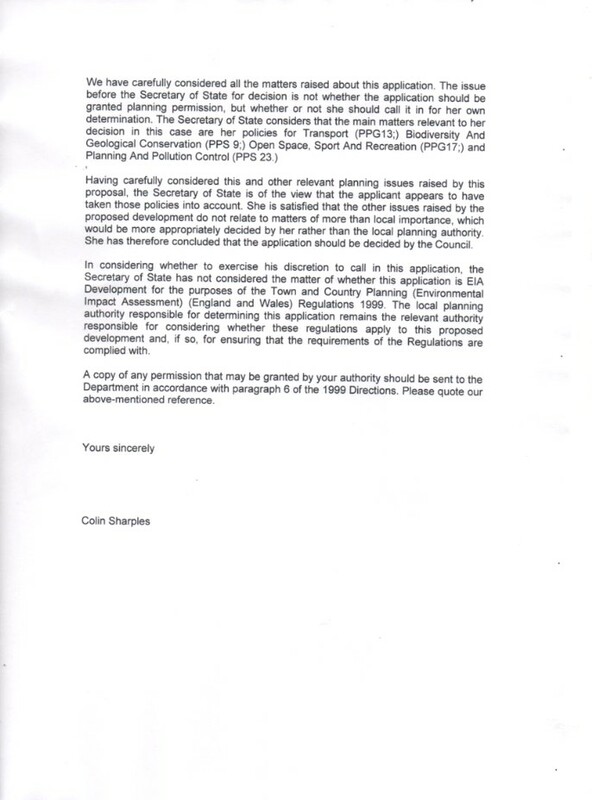 This information will be given to the Planning & Highways Regulation Committee tonight. But they simply ingnored all the policies and procedures. I am writing in response to your request for information below (ref 1240). Chris Woolard did not reply to the email from Rob Peters that you refer to. Attached is the reply from Donna Sager. 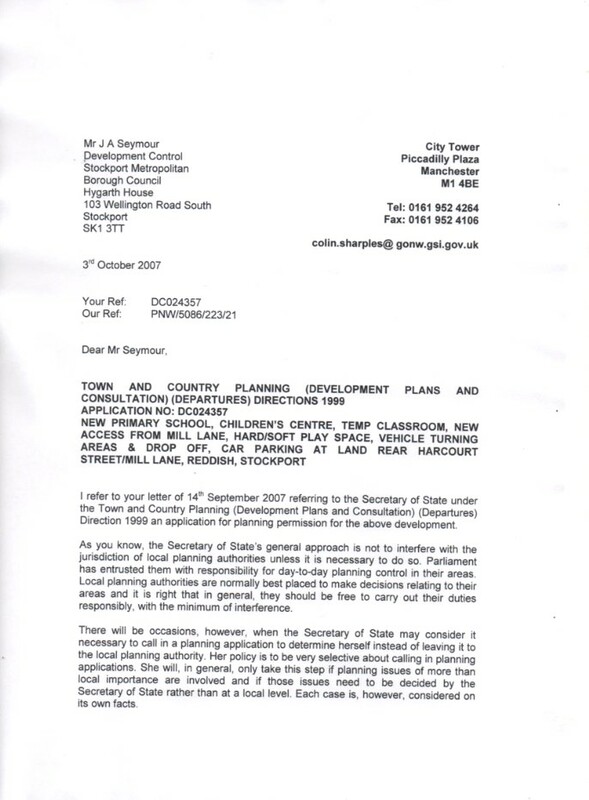 Please could I see under the FOIA/EIR 2004 the reply to Rob Peters' email as mentioned above. 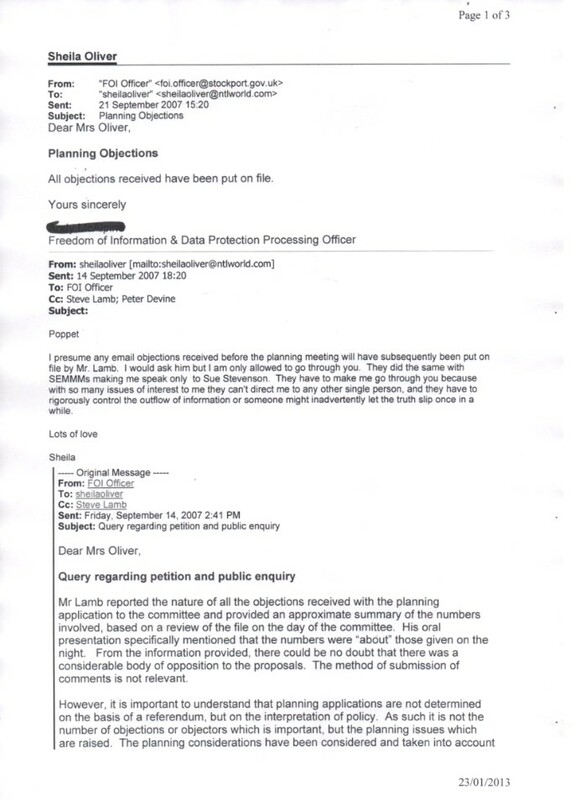 This is to make you and the other recipients of this email fully aware of irregularities regarding the Harcourt Street planning application, which is to go before Tame Valley tomorrow. 1) The application has not been advertised as a departure from the UDP. 2) Local Government legislation regarding the appropriation of public open space has not been complied with. 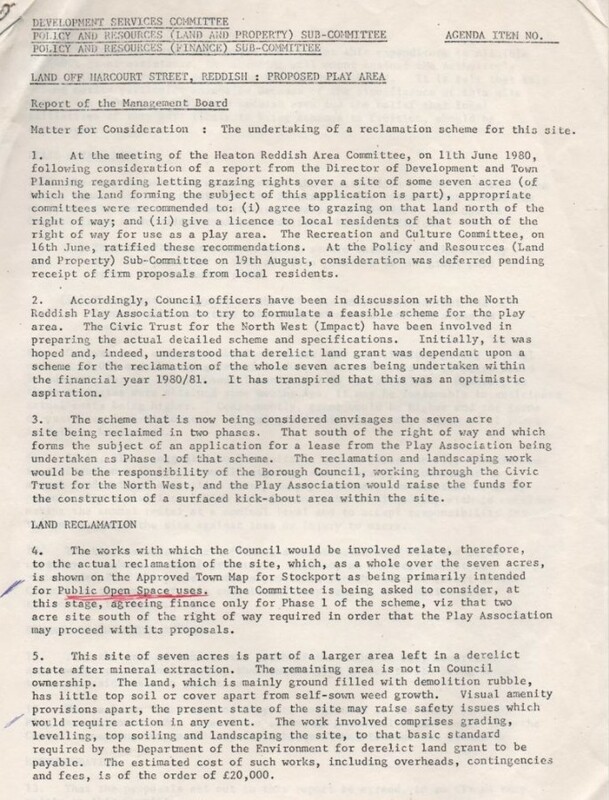 3) Last minute amendments regarding the loss of public open space and traffic measures are not only inaccurate but there has been absolutely no consultation on these; they were only passed to a handful of people on the 25th July. 4) The consultation exercise was corrupt. These exercises are to iron out problems and show the best solution. Because this was a corrupt exercise, problems are only just coming to light, consultants are being paid more and more money to sort them out and the end result will be a disaster for the people of North Reddish. All these issues will be brought to the attention of the Ombudslady and the District Auditor unless we can sort something out now. If you wish, Councillor Goddard, to ensure that no decision is made tomorrow night and to have a meeting, I would be happy to explain the situation to you and maybe we can diffuse what will undoubtedly turn out to be a massive row, which will lead to more expense for the council taxpayer at a public inquiry. Councilllor Weldon told me in the car park (which is the only place to question councillors nowadays) that the process had gone to far to turn back. Well, given the massive cost increases as well, I suggest you stop and think. We hope to have a television crew at the Town Hall tomorrow night to record what is going on. 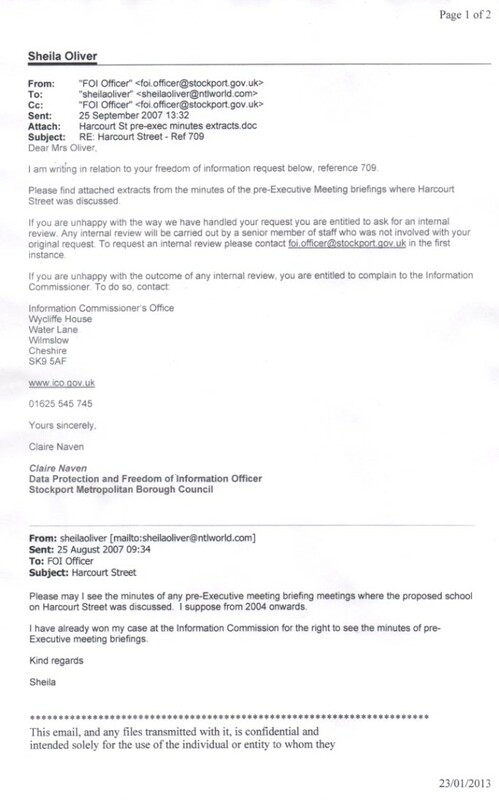 Faber Maunsell produced the Harcourt Street traffic reports, which despite being in Stockport' Council's possession at the end of June were not presented at the "consultations" in August or September. 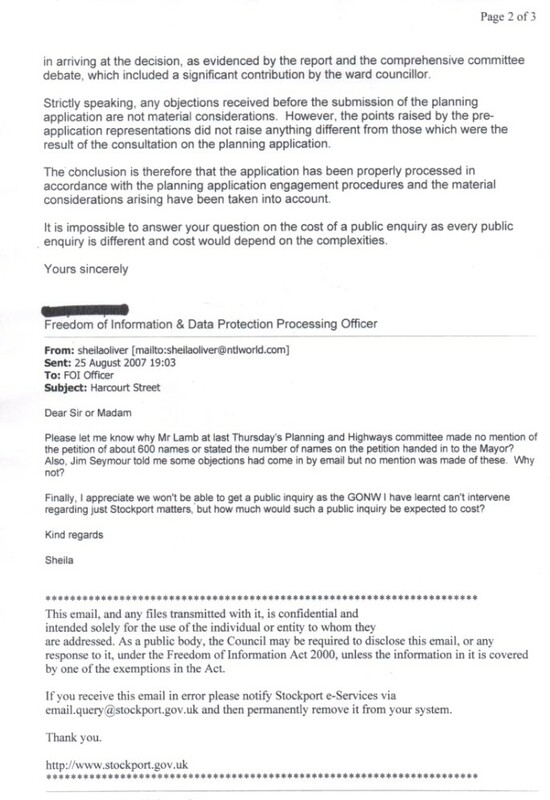 GVA Grimley went ahead with the consultation without the traffic reports being available and I know from previous perusal of FOIA documents last October that traffic was admitted to be the greatest problem. 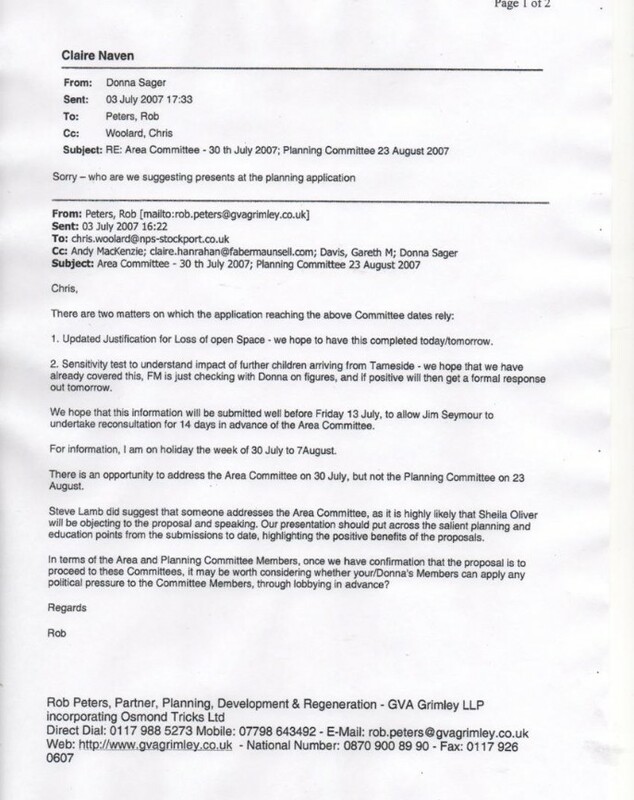 Now that last minute problems have arisen regarding the traffic issue, which will necessitate the further purchase of public open space from Redrow, I presume the consultants - let them fight it out between themselves which - and not the counciltaxpayer will be responsible for the additional costs. Please be aware that this whole issue is going to be put before the District Auditor and the Council won't be able to lie and cheat her. The truth will come out eventually. I smell something on this Fairview school. It was in existence long before 2006, wasn't it? Question: When was Fairway first built and can I have ALL the relevant paperwork relating to its original erection and the 2006 capital spend?